A Russian colonel and a German sergeant cross the lines of war to rescue the colonel's family trapped behind enemy lines in the winter wastes during the WWII Battle of Moscow. Follow the story of Sergei Zalovskiy, Nadezhda and little Clara as an internal war and then a Sunday War threatens their very existence, until an act of kindness committed by a German soldier. 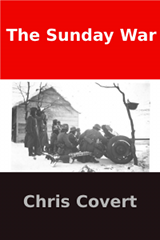 Rantburg.com and borderlandbeat.com correspondent and author Chris Covert presents his second, epic novel of war set in December 1941 war torn Russia.